OXFORD, Mississippi (CNN) -- The average potency of marijuana, which has risen steadily for three decades, has exceeded 10 percent for the first time, the U.S. government will report on Thursday. 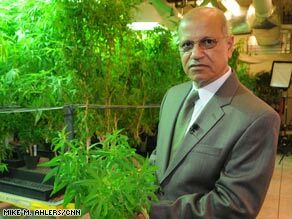 Mahmoud ElSohly says marijuana's potency will continue to rise before tailing off in the next five years. Scientists working for the government predict that potency, as measured by the drug's concentration of the psychoactive ingredient THC, will continue to rise. At the University of Mississippi's Potency Monitoring Project, where thousands of samples of seized marijuana are tested every year, project director Mahmoud ElSohly said some samples have THC levels exceeding 30 percent. Average THC concentrations will continue to climb before leveling off at 15 percent or 16 percent in five to 10 years, ElSohly predicted. The stronger marijuana is of particular concern because high concentrations of THC have the opposite effect of low concentrations, officials say. Potent marijuana also poses significant risk to the developing adolescent brain, said Edward Jurith, acting director of the Office of National Drug Control Policy. Tune in Thursday night for Randi Kaye’s full report on pot's growing potency. Increasing potency is leading to higher admissions to emergency rooms and drug treatment programs, officials say. The average THC for tested marijuana during 2008 was 10.1 percent, according to the government, compared to 1983 when it was reportedly under 4 percent. Even drugs seized at the United States' southwest border are showing increasing potency, the Office of National Drug Control Policy says. The median potency increased from 4.8 percent in 2003 to 7.3 percent in 2007. Marijuana from Mexico and other southern sources traditionally had lower THC content than other sources'. "The children I'm most worried about are children who are heavy users ... people who use it on a daily basis," said Dr. Lawrence Brain, a child psychiatrist in Maryland. Lloyd D. Johnston, a University of Michigan professor who has spent 35 years studying youth drug use, said youth marijuana use has fluctuated dramatically over that period. "One of the driving forces of that ... is the degree to which young people think that marijuana is dangerous," he said. "Perceived risk has usually been a leading indicator of changes." News about potency is not likely to change adolescents' behavior, Brain said. "I'm not advocating the use of marijuana at all," he said. "But in some ways, it is out there. ... Telling them it's 10 percent -- three times more potent than what their parents smoked -- is not an argument they are likely to buy into or to even utilize in any constructive sort of way. "I think they do what they do today. I don't think they consider or reflect on what it might have been like 30 years ago."